Obviously it doesn't provide a totally accurate picture of one's personal beliefs, but it gives us a good idea of where everybody sits. It takes two spectrums of control: economy and society. I would imagine everybody here sits in the bottom left quadrant? You guys take it, post results. 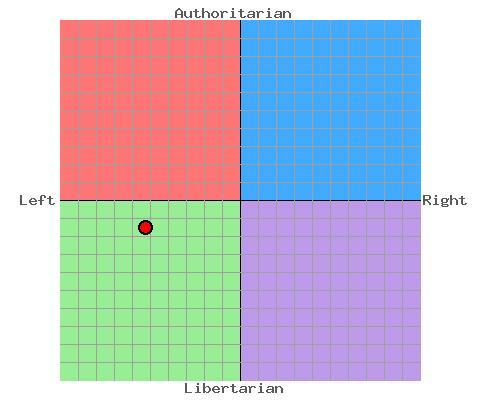 Hmmm, more authoritarian than me, though. Which questions did you answer like a conservative? Bwahahahaahaha!!! I am so left. Wow, apparently my picture has spontaneously changed to make me more fascist. I wonder how that happened? Wow, Romar's even more Authoritarian than me... FASCIST!! !